Hope you all are having a wonderful labor day weekend. We are looking at the 10 day forecast and once again just shaking our heads in disbelief. We are starting to feel the effects of working outdoors and are looking forward to the smoke clearing out. In the last week we made great progress on our new high tunnel, continued planting baby greens and radishes for fall harvests, and continue clearing beds out weekly as the season shifts. Even though it’s hot out, lots of the summer vegetables are coming to the end of their quick season. The zucchini and cucumbers are starting to taper. In warmer climates these are seeded every 2-4 weeks throughout the season to extend the harvest. 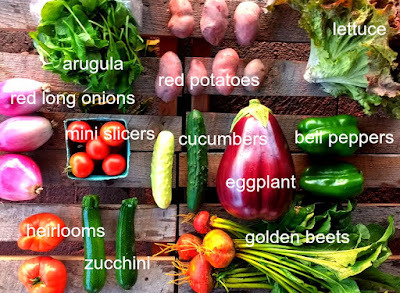 In our short season we feel like getting one main planting of cucs and zucs is appropriate for our climate. We have to remember that most years we would be planning for a serious frost coming at this time of the season. The winter squash are starting to die back showing us what we’ve been suspecting...it looks like this was a great season for winter squash! However, due to the continuous snow cover last winter we have had an unprecedented amount of vole damage on our crops this year. It was the worst in early spring with voles taking out over 50% of some of the early root crops. Despite lots of birds of prey and one really excellent farm cat the Year of the Vole continues as we are seeing crazy vole damage on our winter squash. Usually they will kind of nibble on maybe 1% of the squash and just on the exterior shell. It is usually a couple hundred pounds of cosmetically imperfect squash that we keep for our family to eat. This year, and I have never seen this before? !, the voles have eaten whole squashes. They also really seem to like kohlrabi. Somewhere out in the field there are fat happy kohlrabi and delicata squash-filled voles which we hope turn into fat and happy hawks. For every beautiful perfect vegetable that leaves the farm there are also always some we lose. We kind of get used to it and then sometimes it’s like, wow, really?! 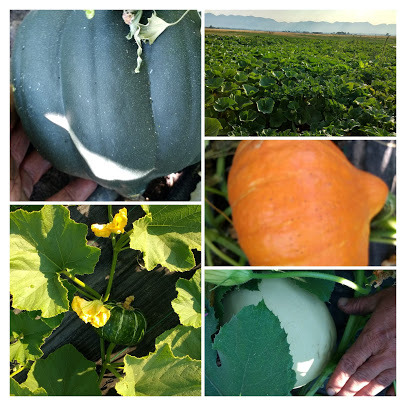 Despite the voles taking more than their share we are still going to have a beautiful panoply of squash coming for our CSA in the next month. This week is the last week for getting potatoes and fresh onions in your shares. Next week it is time to transition to cured alliums including garlic, shallots, yellow and red onions. And, of course, winter squash. Who’s ready for pumpkin pie spice? Cut your potatoes in halves or quarters. Peel and chop golden beets. Chop your red long onions. And ½ a stick of butter in a casserole, add a bit of salt, cover and cook at 350 until cooked through. While cooking make a simple basil pesto. When Potatoes, Beets, and Onions are cooked stir in pesto. Serve this warm on a bed of arugula with any meant and/or beans for a simple, delicious weeknight meal. Thinly chop bell peppers, zucchini, and 1/2-2 red long onions depending on your preference of onion-y-ness. While this is sauteing, thoroughly chop your golden beet tops,. (yes, all of them! They will cook down significantly) add beet tops and cook at a high heat until greens reduce. Pour this into a pie crust (s) for a quiche! Or keep it simple for an eggbake/frittata. We hope you enjoy the arugula this week for fresh salads, lightly wilted/sauted, or you can use it to make an arugula pesto, or throw some into your homemade dressing for a peppery green kick for you salads. The crew was surprised last week at lunchtime when I served hot roasted potatoes and roast venison on top of a heaping generous amount of arugula. Serving hot food on top of arugula reduces the arugula and wilts it just a bit and it all combines into the awesomeness that is ARUGULA. 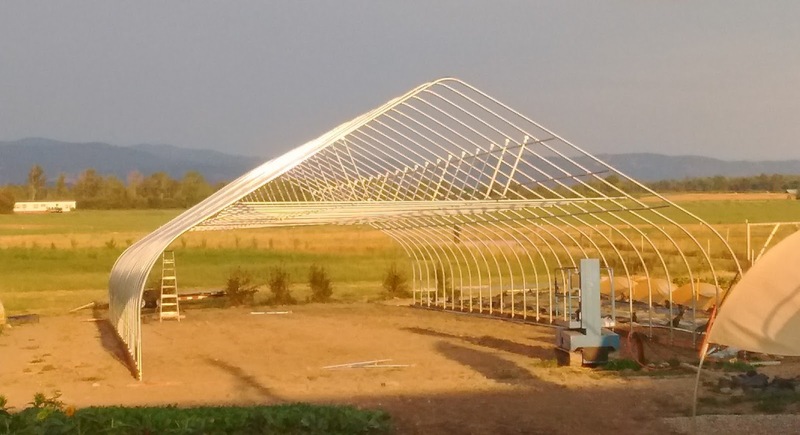 This week's Blog bonus is a pic of our new high tunnel. We made the decision to hire a great friend and an excellent builder of things, Ryan, to spearhead putting it up for us. We knew it was a great decision from the start, but Ryan has been amazing. The first hardest thing to do with these things is get them square when you lay out the posts. He got it square to within 1/2 inch, by dead-reckoning on the first go around. He's amazing. If you see him out working on it Thursday evening at pick up time, honk and wave!